Here’s my own paper. I’ll be publishing work in this area soon. 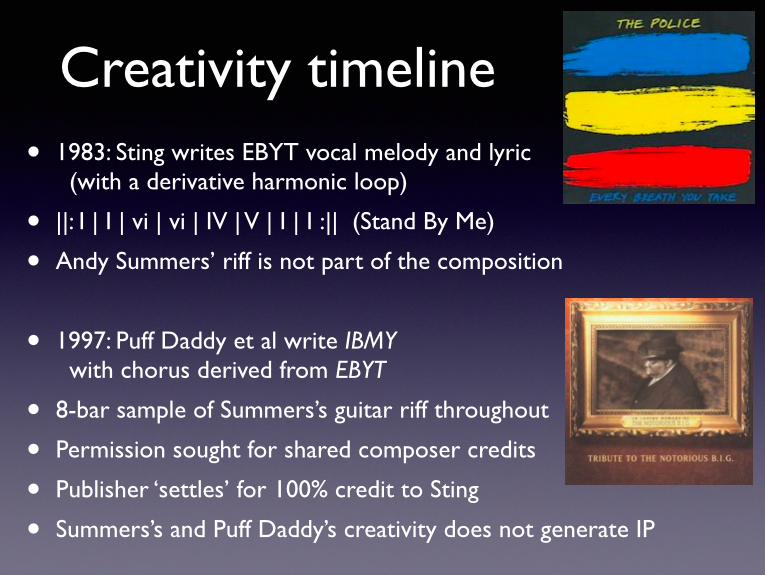 For now here are some examples from the slides plus the list of references. Bellido, Jose. “Forensic Technologies in British Music Copyright.” In Sensing the Law, edited by Sheryl Hamilton, Diana Majury, Neil Sargent, and Christine Wilke. Canadian Initiative in Law, Culture, and Humanities, 2014. Bennett, Joe. “Collaborative Songwriting – the Ontology of Negotiated Creativity in Popular Music Studio Practice.” Journal of the Art of Record Production, no. 5 (2011). Bennett, Samantha. “Revisiting the ‘Double Production Industry’: Equipment Manufacturing, Consumption and the Music Technology Press in the Late 2000s.” Helsinki, 2010. Bently, Lionel. “Authorship of Popular Music in UK Copyright Law.” Information, Communication & Society 12, no. 2 (March 2009): 179–204. Boden, Margaret. The Creative Mind : Myths and Mechanisms. 2nd ed. Routledge, 2004. Csikszentmihalyi, Mihaly. “Society, Culture, and Person: A Systems View of Creativity.” In The Nature of Creativity : Contemporary Psychological Perspectives, edited by Robert Sternberg, 325–39. Cambridge University Press, 1988. Demers, Joanna. 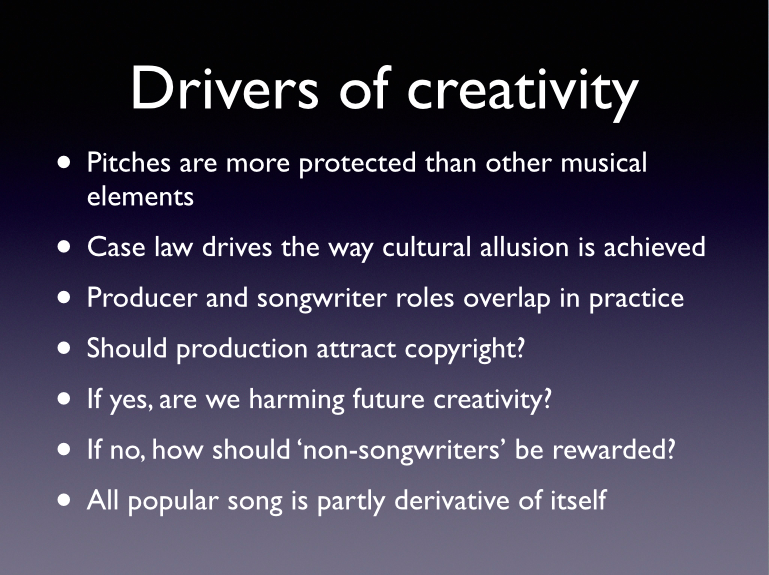 Steal This Music – How Intellectual Property Law Affects Musical Creativity. University of Georgia Press,, 2006. McIntyre, Phillip, and Justin Morey. “Working out the Split”: Creative Collaboration and Assignation of Copyright across Differing Musical World.” Journal on the Art of Record Production, no. 5 (2011). 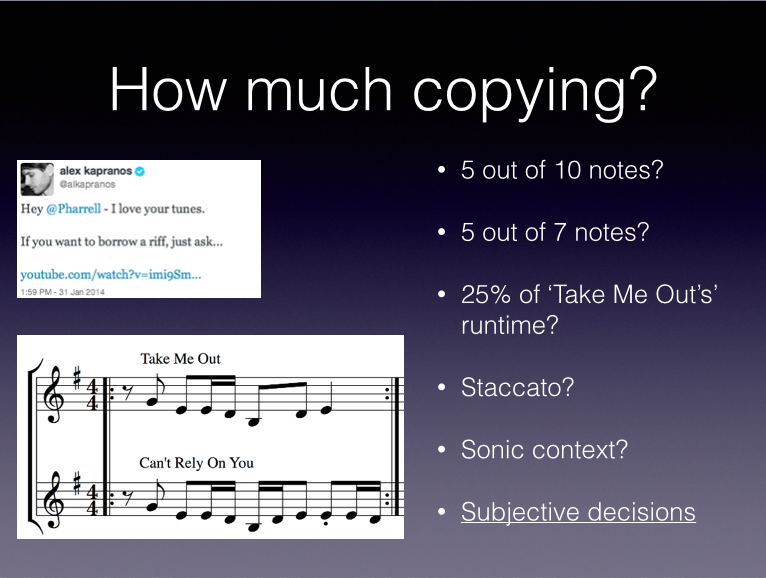 Moore, Allan F. Song Means : Analysing and Interpreting Recorded Popular Song. Ashgate, 2012. Excellent summary – and well done finding those links and videos – nice job!